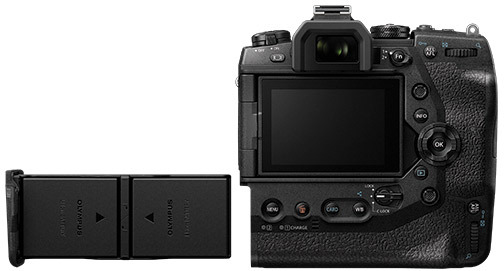 Las Vegas, NV—Olympus introduced the OM-D E-M1X Micro Four Thirds professional interchangeable-lens camera. 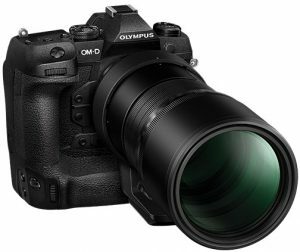 “The Olympus OM-D E-M1X is packed with industry leading speed, performance, reliability and high-quality image output that rivals that of full-frame DSLRs,” the company announced. The professional-aimed camera has an integrated vertical grip to provide a secure hold. For an improved grip, it has a deep finger rest for holding the camera either horizontally or vertically. The E-M1X also offers impressive image stabilization performance. It delivers 7 shutter speed steps of compensation when using in-camera stabilization alone. When combined with the stabilized M.Zuiko Digital ED 12–100mm f/4.0 IS Pro lens, the camera achieves 7.5 shutter speed steps of compensation. 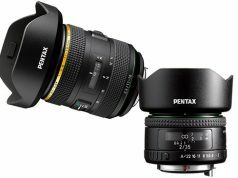 Its 5-axis image stabilization and electronic stabilization also enable smooth handheld 4K and cinema 4K video recording, without stabilizing gear. In addition, three selectable levels of IS effects are provided. 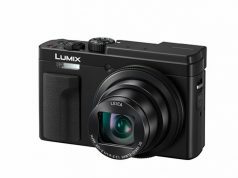 Moreover, the mirrorless model provides zero-lag pro capture mode, 60-frames-per-sec continuous shooting, and a handheld high-res shot mode. The camera’s speed and responsiveness are due to its dual TruePic VIII image processors. In addition, silent mode (electronic shutter) is functional during both 60-fps high-speed shooting in AF/AE lock and 18-fps (max) continuous shooting with AF/AE tracking. This is useful for shooting various activities, performances and events where the shutter sound could be distracting. The camera’s 121-point all-cross-type on-chip phase-detection AF sensor delivers live view images. It utilizes autofocus information from recorded images for quick tracking of unpredictable subject movement and speed. In addition, when an f/1.2 lens is attached, the AF low-light limit is -6 EV. This permits focusing in dark situations and with low-contrast subjects. 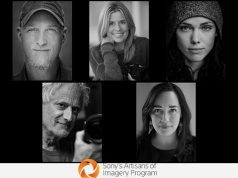 Various autofocus settings are available to meet the needs of professional photographers. They include multiple AF target modes; AF area position settings when holding the camera vertically or horizontally; and turning the focusing ring in C-AF AF to instantly switch to manual focus using C-AF+MF mode. Furthermore, the new 25-point group target and custom AF target were added to the available AF target modes for greater operating freedom. Furthermore, artificial intelligence (AI) based Deep Learning technology was utilized to develop algorithms for the camera’s intelligent subject detection AF feature. It detects three types of subjects, including motorsports, airplanes as well as trains, focusing on and tracking the optimal area. For example, it sets pinpoint focus and locks onto a driver’s helmet during motorsports, so users can focus on composition. Another highlight is an AF multi-selector that provides greater freedom over composition. The multi-selector works in both the horizontal and vertical positions, so users can quickly shift focus areas while looking through the viewfinder. The joystick allows for diagonal movement of the AF point, making it possible to smoothly shift AF areas during sequential shooting and video recording. 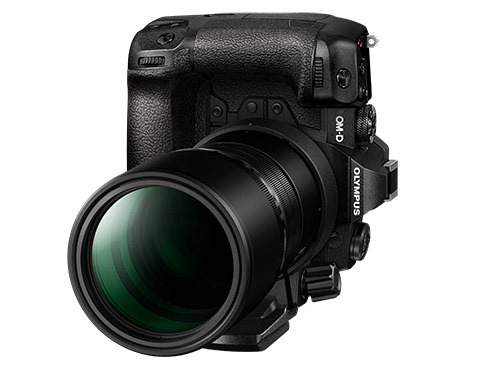 The camera’s viewfinder boasts a new optical design and a 0.83x (35mm equivalent) magnification. Its four-element configuration employs aspherical as well as high reflective index lenses to provide a clear, distortion-free display to the edge of the viewfinder. Like the OM-D E-M1 Mark II, the new model’s viewfinder has a 120-fps (progressive scan) high-speed rate with a 0.005-second latency. In addition, the layout, shape and height of all buttons and levers were redesigned to enable users to concentrate on shooting through the viewfinder. Moreover, a C-lock lever allows users to disable numerous buttons and dials on the camera when in the vertical or horizontal position, to avoid accidental setting changes. Notable is pro capture mode, which records up to 35 frames retroactively from when the shutter button is released with no blackouts (image loss). It records at 20 million pixels and offers support for RAW capture. Also, in addition to 80MP high-res shot images that can be captured using a tripod, handheld high-res shot mode is available for those instances when using a tripod is not possible. Moreover, live ND is included for slow shutter speed effects without using an ND filter. This new technology combines multiple exposed images in-camera to attain slow shutter effects. It’s also possible to check the slow shutter effects in the viewfinder before shooting. There are five effects levels: ND2 (equivalent to one shutter speed step); ND4 (2 steps); ND8 (3 steps); ND16 (4 steps); and ND32 (5 steps). Another function is anti-flicker shooting/flicker scan. The camera can detect the flicker frequency of artificial light sources, like fluorescent lighting, and activate the shutter at peak brightness to eliminate uneven exposures and coloring between sequential frames. In addition, flicker scan suppresses striped patterns that can occur using silent mode and when shooting movies, so users can fine-tune the shutter speed. Also, for shooting in severe conditions, the camera is dustproof, splashproof as well as freezeproof (14°F). Plus, a new coating is used on the supersonic wave filter, which vibrates 30,000/sec to remove dust and dirt more effectively than previous Olympus models. In addition, the shutter is rated for 400,000 cycles. Other features include: a field sensor system with a built-in GPS sensor, temperature sensor, manometer and compass; Wi-Fi; 120-fps Full HD video recording for slow motion playback; two high-speed UHS-II SD card slots; USB-C power delivery; and a cartridge battery insertion system with the capacity for two BLH-1 lithium-ion batteries. The camera captures approximately 870 shots, and users can replace the batteries even when the camera is attached to a tripod. 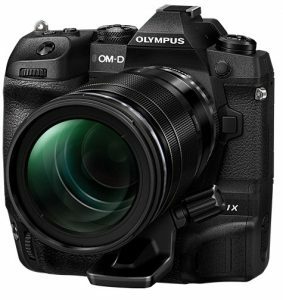 The Olympus OM-D E-M1X (in black) will ship in late February for $2,999.99. Olympus is also offering various optional accessories for use with the OM-D E-M1X camera. The FL-700WR is a wireless radio-wave-shooting compatible electronic flash. 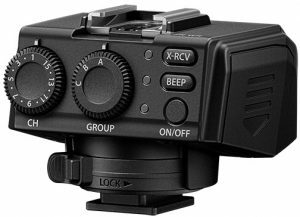 During wireless shooting, it functions as a commander or flash with a built-in receiver. The portable unit delivers high intensity at a maximum guide number of 42 (ISO 100/m). Its dustproof, splashproof and freezeproof (14°F) construction complements the rugged OM-D E-M1X. Moreover, full flash intensity is possible with a 1.5-sec charging time. This permits sequential flash photography at 10 fps. The FC-WR wireless commander and FR-WR wireless receiver control multiple flash units remotely from the camera. It, too, is dustproof, splashproof and freezeproof (14°F). The commander can connect to three groups and an unlimited number of flash units. Users may also select which group to fire and not fire and configure the flash intensity. Olympus Workspace image management software provides image viewing and editing functions. RAW processing preview speed is now faster to streamline the post-shooting workflow. The rating function was also improved for quicker selection of the best shots from large collections of images. In addition, a multi-window environment is now supported along with other controls for a more satisfying work process. 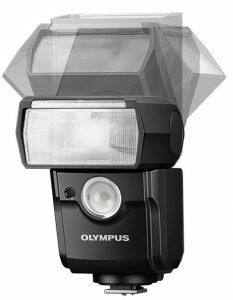 Olympus camera owners can download Olympus Workspace free of charge.